The beginning of June brings to close another school year, the beginning of summer, swimming, the beach, and the many outdoor activities we all enjoy. But with June also comes the start of hurricane season. With all the pleasures that come with living in the Lowcountry also comes the possibility of hurricanes. 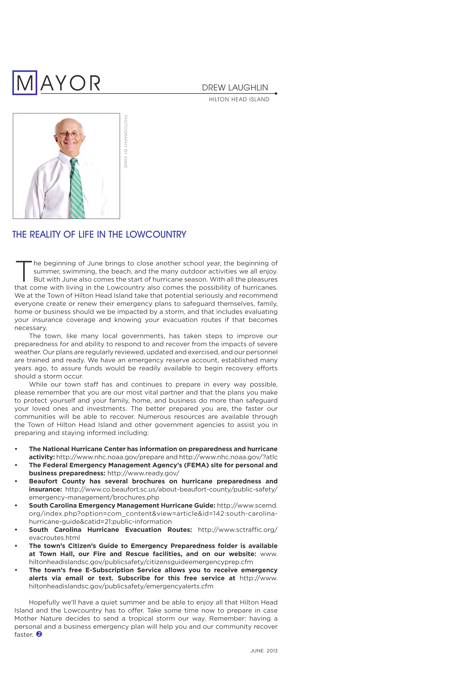 We at the Town of Hilton Head Island take that potential seriously and recommend everyone create or renew their emergency plans to safeguard themselves, family, home or business should we be impacted by a storm, and that includes evaluating your insurance coverage and knowing your evacuation routes if that becomes necessary. The town, like many local governments, has taken steps to improve our preparedness for and ability to respond to and recover from the impacts of severe weather. Our plans are regularly reviewed, updated and exercised, and our personnel are trained and ready. We have an emergency reserve account, established many years ago, to assure funds would be readily available to begin recovery efforts should a storm occur. Hopefully we’ll have a quiet summer and be able to enjoy all that Hilton Head Island and the Lowcountry has to offer. Take some time now to prepare in case Mother Nature decides to send a tropical storm our way. Remember: having a personal and a business emergency plan will help you and our community recover faster. 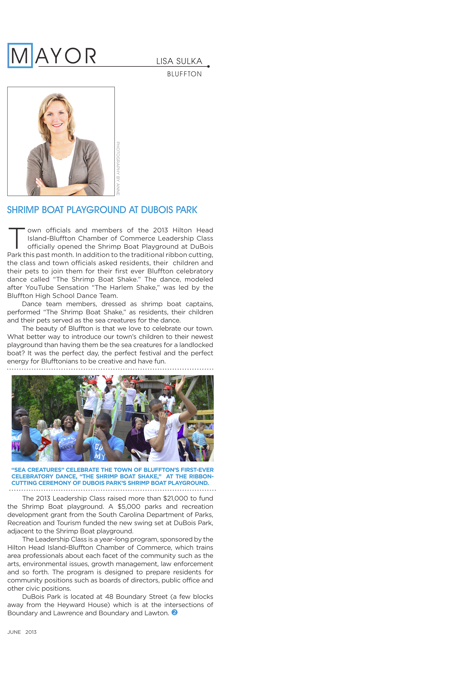 Town officials and members of the 2013 Hilton Head Island-Bluffton Chamber of Commerce Leadership Class officially opened the Shrimp Boat Playground at DuBois Park this past month. 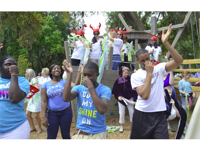 In addition to the traditional ribbon cutting, the class and town officials asked residents, their children and their pets to join them for their first ever Bluffton celebratory dance called “The Shrimp Boat Shake.” The dance, modeled after YouTube Sensation “The Harlem Shake,” was led by the Bluffton High School Dance Team. Dance team members, dressed as shrimp boat captains, performed “The Shrimp Boat Shake,” as residents, their children and their pets served as the sea creatures for the dance. The beauty of Bluffton is that we love to celebrate our town. What better way to introduce our town’s children to their newest playground than having them be the sea creatures for a landlocked boat? It was the perfect day, the perfect festival and the perfect energy for Blufftonians to be creative and have fun. The Leadership Class is a year-long program, sponsored by the Hilton Head Island-Bluffton Chamber of Commerce, which trains area professionals about each facet of the community such as the arts, environmental issues, growth management, law enforcement and so forth. The program is designed to prepare residents for community positions such as boards of directors, public office and other civic positions. DuBois Park is located at 48 Boundary Street (a few blocks away from the Heyward House) which is at the intersections of Boundary and Lawrence and Boundary and Lawton.